Spring is near! And Kohl’s have come out with Gold Star Clearance for you to shop for an affordable Spring wardrobe! Just visit the link below and choose your favorite item! You can save up to 70% on different items at Kohls Clearance! Click Here for Kohls Clearance! 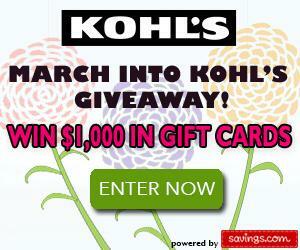 To celebrate the start of Spring, Savings.com is giving away $1,000 worth of gift cards to Kohl’s! 20 winners will receive a $50 gift card to Kohl’s! Starts from Thursday, March 5th at 12:00 AM ET to Sunday, March 8th at 11:59 PM ET. Open to US residents, 18+.